How much does it cost to travel to Basel? How much money will you need in Basel? Sfr170 ($168) is the average daily price for traveling in Basel. The average price of food for one day is Sfr38 ($37). The average price of a hotel for a couple is Sfr232 ($228). Additional pricing is in the table below. These average travel prices have been collected from other travelers to help you plan your own travel budget. Basel is often overlooked as a tourist destination in Switzerland, but despite this, it does have a lot to offer visitors as well as a beautiful medieval historic center. Every year it also hosts a Carnival festival that is one of the most popular in Europe, competing with those in Venice and Rio de Janeiro in its popularity. There are also some excellent museums and great examples of regional architecture around town. Basel also serves as an excellent entry point to the Swiss Jura mountains and a jumping off point to visit more popular cities such as Zurich or Lucerne. The town is located in the northwestern corner of the country and has a border with both France and Germany. This location means it's also a good entry point to the French region of Alsace and the German Black Forest. Basel averages about 120 days of rain or snow every year and the rainiest month is June when you can expect rain for about 11 days. February is the driest month but snowfall is not uncommon. Because Basel has a rich cultural history, you'll find a good number of interesting sights around town. Many of the sights are concentrated in the old town area, which is between the Basel Zool and the Rhine. This area is easily walkable and a great place to explore. Many of the stores close on Sundays, so it is best to save museums, which are usually open, for that day. Sights around town include Marktplatz, or the Market Square, Rathaus, the town hall, the Gates to the Walled City, Kunstmuseum Basel, Fondation Beyeler, Museum Jean Tinguely, Schaulager and Museum der Kulturen among many others. You can wander around the cobblestone streets from Marktplatz to Munsterplatz (Cathedral Square). There you can see Basel's Munster, or cathedral, which was built between 1019 and 1500 in the Romanesque and Gothic style. Make sure you check out the views from the Pfalz, or plaza, that is north of the Munster. They look out over the Rhine and are some of the best around town. It's also a great area to enjoy a picnic. Most of Basel's sights and attractions are concentrated in the old town area, which is easily walkable. The area stretches from the Basel Zoo, which is just south of the Basel SBB train station, to the Rhine. In addition to seeing the countless sights around town, there are many activities you can enjoy in Basel. Theater is quite popular in Basel, as are sporting events such as football (soccer). There are any number of music concerts going on around town on any given week and there are often festivals or art shows that are well worth a visit. 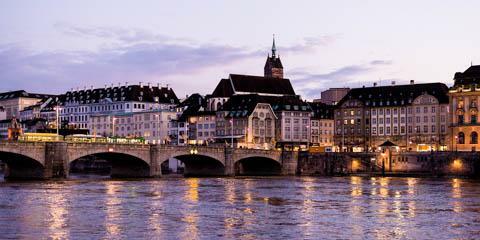 There is a very good and diverse number of restaurants and cafes around Basel. Around the streets of the old town you'll find many cafes that offer outdoor seating during the summer months. In general, the food in Basel is more expensive than elsewhere in Europe, but comparable to that in other Swiss cities. The cheapest option for budget travelers is to buy some food at a supermarket and prepare your own meals. Most of the supermarkets close early in the evening, so if you hope to do this, then it is best to plan ahead earlier in the day. It is also possible to cross the border into nearby France or Germany and dine for slightly less money. Most people choose to walk around Basel. The city itself is quite small and there are some fascinating narrow, winding roads that weave their way through the city. There are also a number of areas around town that are pedestrian only and closed off to vehicular traffic. Specifically, some of the more popular shopping streets are limited to foot traffic only. You will find yourself walking a good amount in Basel, particularly on uneven cobblestone streets that can be somewhat difficult to navigate. For this reason it is important that you be prepared with proper footwear. If you're traveling a greater distance, the city does offer a good tram and bus system that is relatively easy to understand and navigate. Both the trams and buses are usually on time and affordable. They are convenient and provide you with access to most of the city. Bicycling is also easy in Basel as the city is very bike friendly with many well marked bike lanes and amenities for bicyclists. Bikes can be rented from the Rent-a-Bike underground bike park that is located at Centralbahnplatz under the Basel SBB railway station. There are four small ferry boats that operate in Basel as well. The most popular one is the one that starts in Grossbasel just below the Munster. There are also day excursions that go up and down the Rhine on large motor boats. Are you a student or backpacker headed to Switzerland or Austria? Need a hostel in Zurich or Vienna?